Democratic presidential candidate Hillary Clinton is focusing her campaign on appeals to Republican politicians and the national-security establishment, arguing that Republican Donald Trump is too friendly to Russian President Vladimir Putin and has repeatedly insulted the military. Commenting on Wednesday night's Commander-in-Chief Forum in New York City, broadcast by NBC, where the two candidates made back-to-back half-hour appearances, Clinton told reporters outside her campaign plane: "Bizarrely, once again, he praised Russia's strong man, Vladimir Putin, even taking the astonishing step of suggesting that he prefers the Russian president to our American president. Now, that is not just unpatriotic and insulting to the people of our country, as well as to our commander-in-chief. It is scary because it suggests that he will let Putin do whatever Putin wants to do and then make excuses for him." Clinton also modified her statement during the forum, ruling out any return of US ground troops to Iraq or any dispatch of such forces to Syria. She told the press that she was opposed to putting a "big contingent" of American troops in the two countries, rendering her pledge meaningless and suggesting that an open-ended intervention by significant numbers of US ground troops was entirely possible. The Democratic candidate went on to denounce Trump's declaration at the forum that under the Obama administration, American generals had been "reduced to rubble." 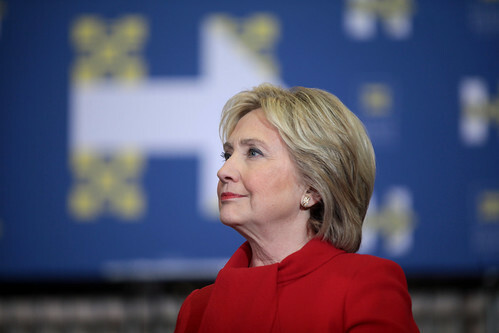 Clinton invoked the Republican president most identified with Cold War anticommunism and militarism, posing the question, "What would Ronald Reagan say about a Republican nominee who attacks America's generals and heaps praise on Russia's president? I think we know the answer." She then concluded, "Every Republican holding or seeking office in this country should be asked if they agree with Donald Trump. Republicans are in a terrible dilemma of trying to support a totally unqualified nominee." These rhetorical appeals to Republicans were followed by a meeting Friday between Clinton and top former officials in the state and military-intelligence apparatus. Participants included two former secretaries of Homeland Security who have endorsed Clinton, Republican Michael Chertoff, from the Bush administration, and Democrat Janet Napolitano, from the Obama administration. Also participating was General David Petraeus, the former head of the CIA; Richard Fontaine, former foreign policy advisor for Senator John McCain; and Michael Morell, former acting director for the CIA. Clinton said that one of her priorities on national security was to "hunt down" Islamic State leader Abu Bakr al-Baghdadi. His assassination, like the killing of Osama bin Laden in 2011 at Obama's orders, would "send a resounding message that nobody directs or inspires attacks against the US and gets away with it." The Democratic candidate for vice-president, Senator Tim Kaine of Virginia, made an even blunter denunciation of Trump's praise for Putin Friday, telling CBS's "This Morning" that Trump's comment "betrays an irrationality and a hostility to the president that's unpatriotic." Kaine even suggested that's Trump's joking remark last month, suggesting that the Russian government had probably hacked into Hillary Clinton's private server and should release the 30,000 emails she claims to have deleted, could result in criminal charges. "We impeached a president for that, what he has encouraged Russia to do," Kaine said, adding that Richard Nixon was "impeached for encouraging crooks to commit espionage against the DNC in a presidential year to get an edge." Senate Minority Leader Harry Reid said that if a prominent Democrat had praised Putin as Trump did, "we would be through." Congressman Charles Rangel added, referring to Putin, "A communist leader that's a potential enemy!" Underscoring its effort to win support with outright redbaiting, the Clinton campaign released a video of news footage of several of Reagan's children deploring the possibility of a Trump presidency. Michael Reagan, a longtime ultra-right talk radio host, said in one clip, "My father would be appalled." The Clinton campaign also released a list of 15 retired generals and admirals who have recently endorsed Clinton, adding to the 95 on the initial list released Wednesday. Air Force Major General Peter Cooke referred specifically to Trump's statements at the Commander-in-Chief Forum, as well as his aspersions against Republican Senator John McCain, a Vietnam-era POW, saying, "Anytime anyone states that generals are rubbish or an individual is not a hero because he or she was captured I find it appalling... I'm proud to support Secretary Clinton." The campaign also publicized a tally of all cabinet-level officials in the administration of George W. Bush, conducted by Huffington Post, which found nine supporting Trump and seven declaring they will not support him, with another 18 who have not publicly declared a position, including former Secretary of State Condoleezza Rice and former National Security Adviser Stephen Hadley. Congressional Republican leaders sought to distance themselves from Trump's statements praising Vladimir Putin. House Speaker Paul Ryan called Putin an "aggressor," adding that it "certainly appears" that Russia was waging cyberattacks on the US political system, as Democrats have claimed. "That is not acting in our interests and that is an adversarial stance and he is acting like an adversary," Ryan said.